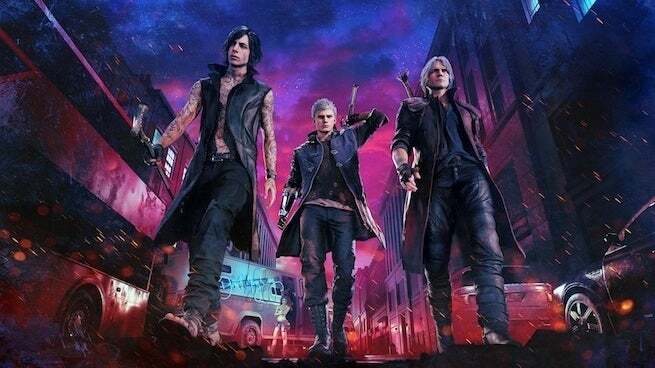 For the first time in the series, Devil May Cry 5 will allow players to select between two, sometimes three different characters for certain missions. Said characters include: Nero, Dante, and V.
News of the new feature comes way of Capcom's Matt Walker (via ResetEra), who confirmed as much on Discord. "We've mentioned that there will be a bunch of missions in the game," writes Walker. "For some missions you'll have 1 character you can play as, for some you can select between two, and for some you can select between all three." Walker doesn't divulge how many of these type of certain missions there will be, but from the sounds of it, there will be multiple. Or in other words, multiple times to choose Dante, because who in their right mind would choose Nero or V over Dante? While whoever you choose will certainly impact the moment-to-moment gameplay, it is unclear if it will impact the story at all. It's quite possible that depending on who you're playing as characters will interact with you differently, but this isn't made clear by Walker or Capcom, so for now all we can do is speculate. Chances are it won't do this. "The threat of demonic power has returned to menace the world once again in Devil May Cry 5. The invasion begins when the seeds of a “demon tree” take root in Red Grave City. As this hellish incursion starts to take over the city, a young demon hunter Nero, arrives with his partner Nico in their “Devil May Cry” motorhome. Finding himself without the use of his right arm, Nero enlists Nico, a self-professed weapons artist, to design a variety of unique mechanical Devil Breaker arms to give him extra powers to take on evil demons such as the blood sucking flying Empusa and giant colossus enemy Goliath."